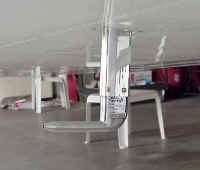 Unfortunately all of my empennage, and most wing construction, photos have been misplaced (polite word for LOST, grrr!). I'm leaving this page here with the hope I'll locate them and be able to document that phase, and to mention the alternate method I used for my pitot/static system. I do at least have one pic to prove that I built them. I'm not happy about losing the others! 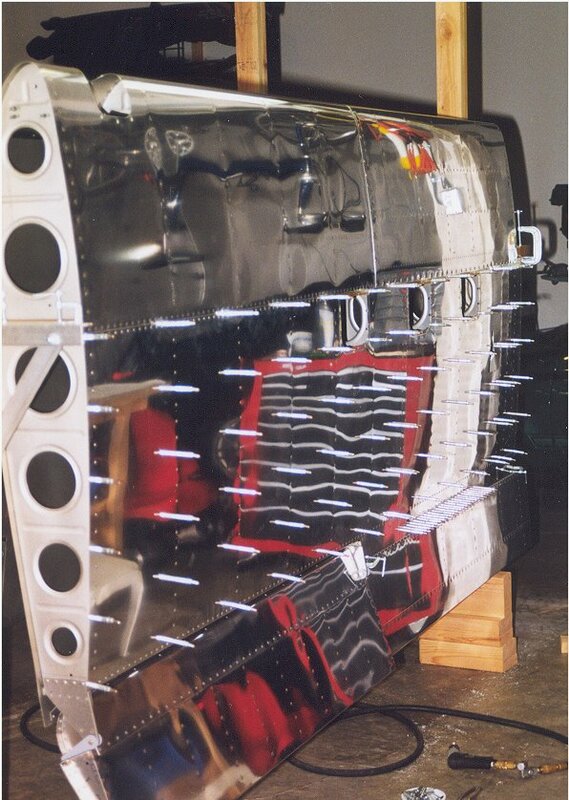 The pic to the right is a shot taken at nearly the end of wing construction. I have already finished the wing structure and mounted the flaps and ailerons. The only remaining thing at this point is to do is the final riveting of the bottom skins. Builder's tip: I don't have any pictures of it, but when you are mounting your wings you will need to align four things on each wing: the aileron, the wing tip, the flap, and the flap fairing. You will immediately wonder what to use as a reference, and it doesn't tell you in the manual. Here's the trick: align the aileron with the outboard wing ribs by centering the tooling holes in both wing ribs and the aileron rib. You will need a 5' straightedge to do this. 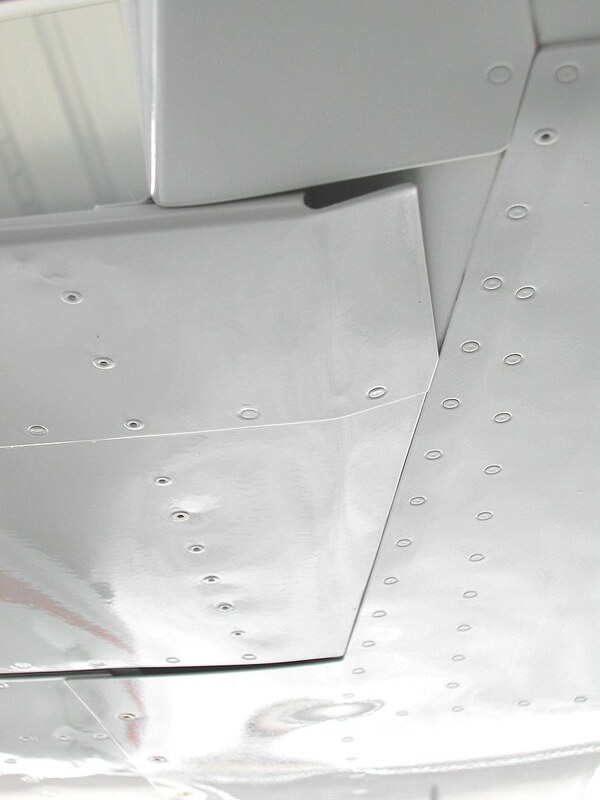 Then duct tape the aileron in place and line up the flap to match. 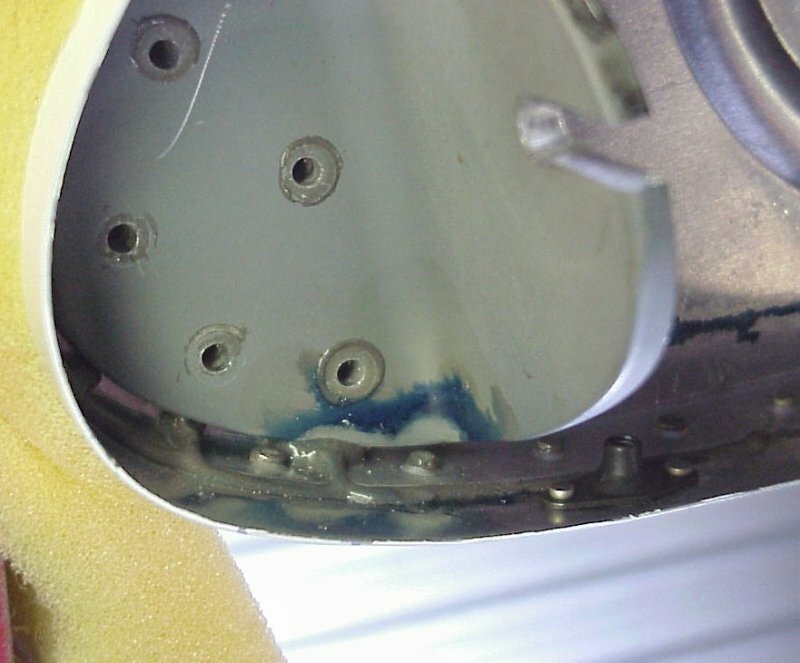 Working your way inboard you can then install the flap fairing correctly so the flap fits into it perfectly when fully retracted. Keeping the aileron in place with the duct tape then fit the trailing edge of the wing tip, which has quite a bit of adjustment possible with it, to the trailing edge of the aileron. 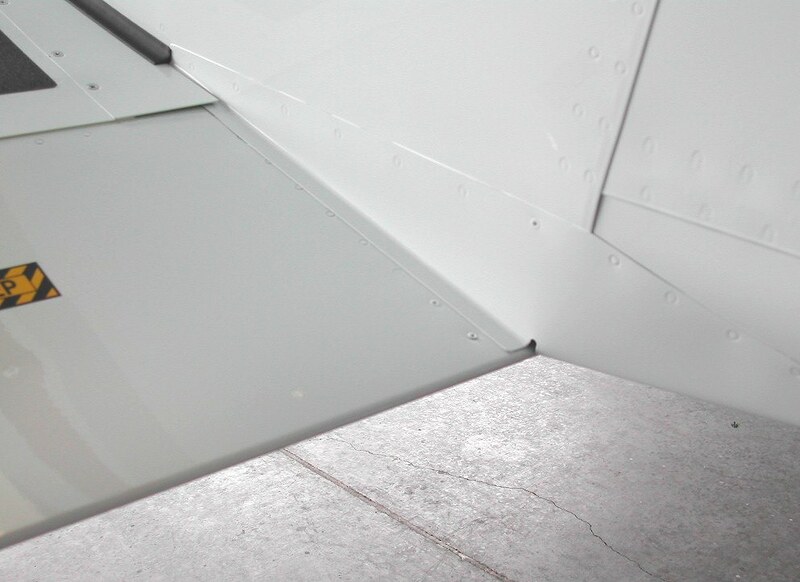 Voila, you now have the entire trailing edge aligned exactly where it's supposed to be. 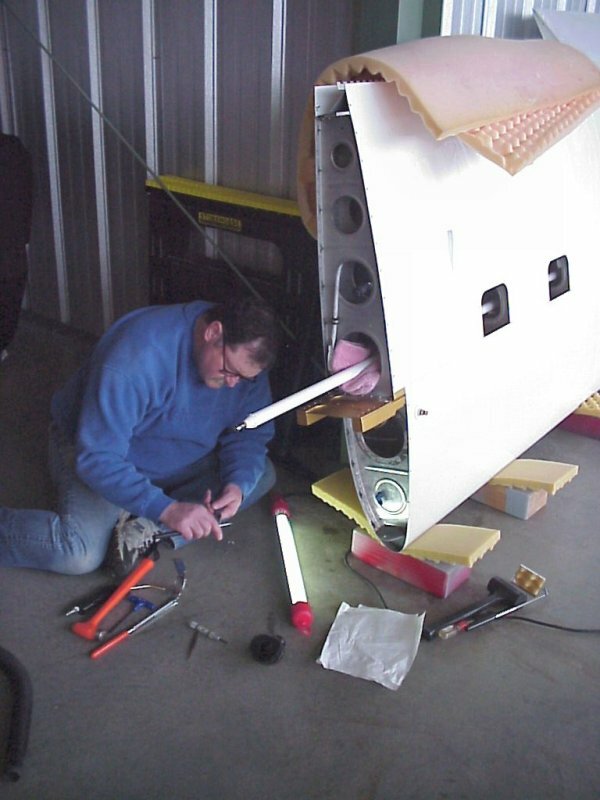 When mounting the wings you will not only be drilling the rear spar so as to get incidence and sweep correct, you will be aligning the wingtips, ailerons, and flaps in order to mount the flap fairings in the correct place. 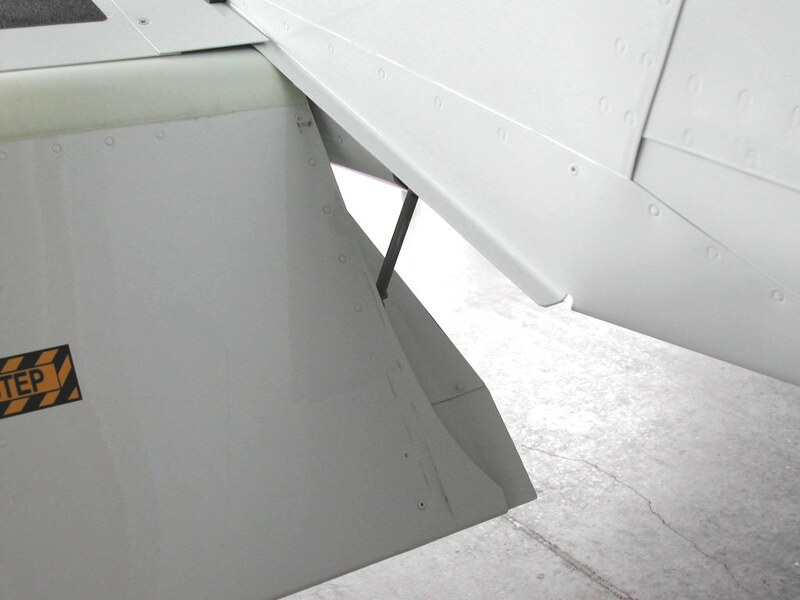 Builders are distressed when the bottom of the flap doesn't line up flush with the bottom of the fuselage. I've now mounted three sets of RV-8 wings, and when the incidence is set correctly the flaps will indeed be below the fuselage. There is an indirect reference to this in the manual. I've tried explaining how the flap should be trimmed to nest into the fuselage bottom but pictures are easier, so here is how I did mine. 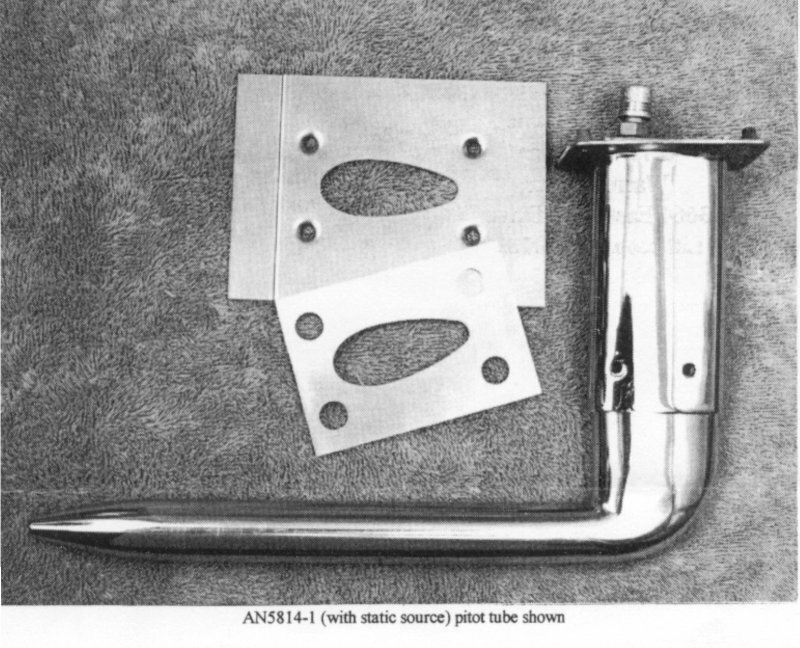 On 6/12/2000 Van's Aircraft issued a Service Notice regarding the addition of a bracket to prevent rotation of the fuel tank pick-up tube for fuel tanks not using flop tubes. The Service Notice can be downloaded from their web site at www.vansaircraft.com/public/notices.htm. 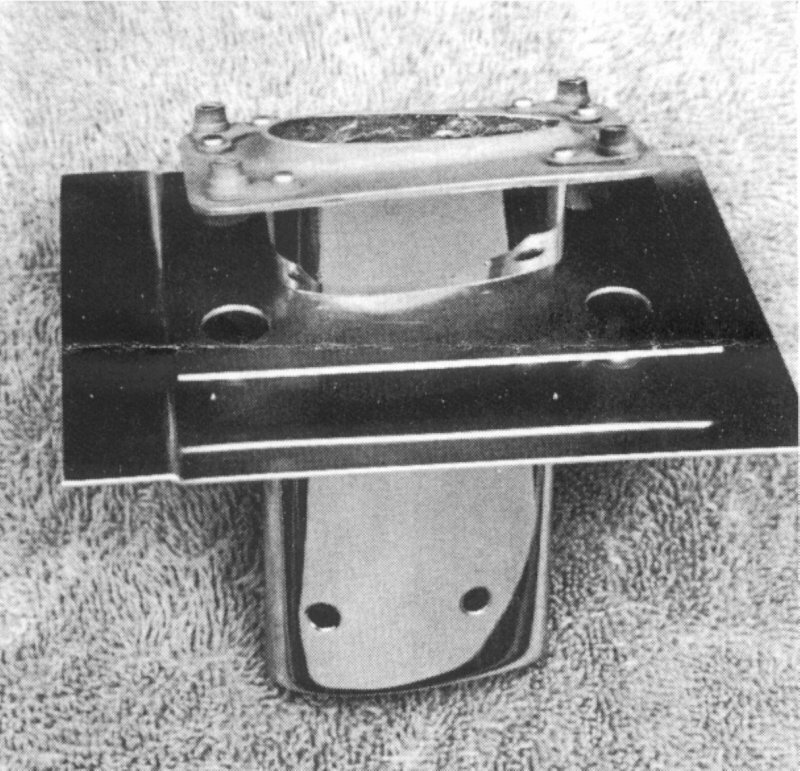 This pic shows the bracket I made to conform with this modification. Note that my bracket is slightly wider than called for so as to make riveting easier. 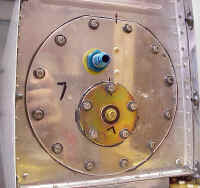 If made to the Van's drawing it's a bit difficult to set the rivets due to interference with the AN fitting. While doing this mod I took the opportunity to change the way I sealed the inspection and fuel level sender covers. 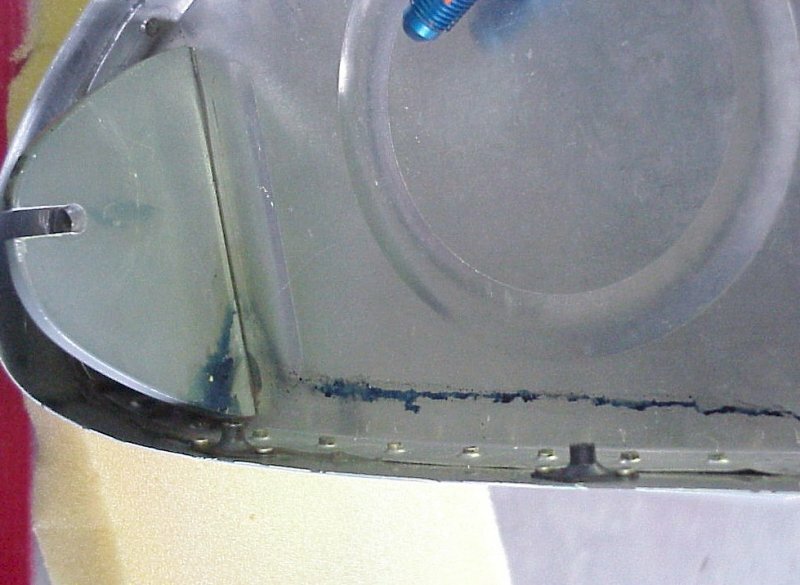 They were originally sealed with Fuel Lube smeared on of the gaskets and on the screws. Based on feedback from other builders on the RV List I chickened out and changed to ProSeal with no gaskets. 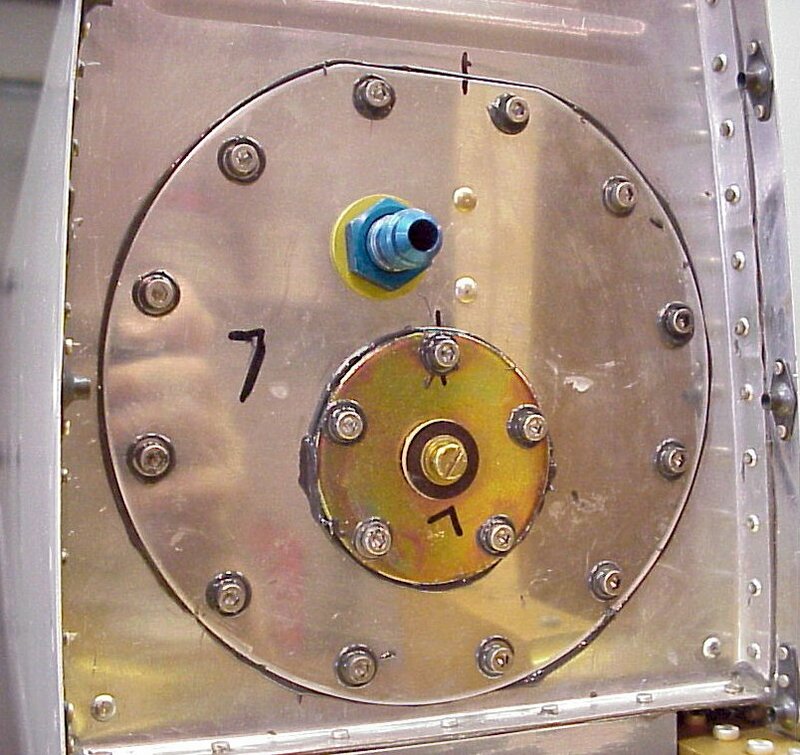 I also used stainless steel hex head screws with washers so as to be able to remove them if necessary when the wings are installed on the plane. We were very careful to see that ProSeal oozed out from underneath each washer and screw head thus ensuring a good seal... don't want any fuel links! When I was building my wings and it came time to install the standard pitot tube, I balked a bit at the inelegant design of the standard tube. Through the RV List I became aware of an alternative made by Warren Gretz, who lives in Colorado. 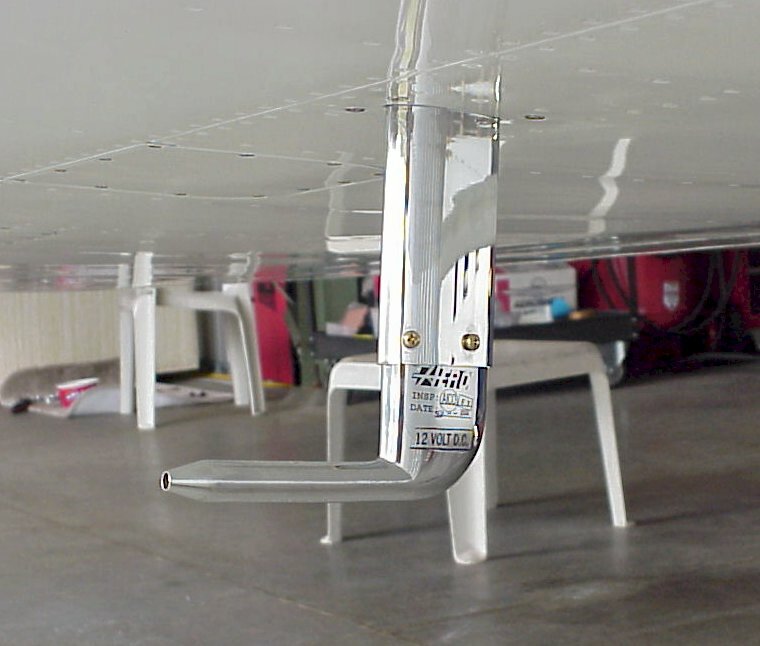 He manufactures a mount that allows you to install a standard AN5814 heated blade-style pitot tube anywhere in the wing you choose. You can get further information on Warren's products at his web site at www.gretzaero.com. This is Warren's mount which he charges about $100 for. 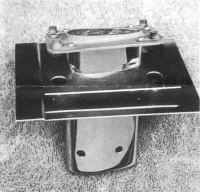 I installed mine one bay outboard of the standard location. This will put it far clear of any turbulence or interference caused by the tie-down rings. Also, it is easily accessible through the outboard wing access cover. I will use flexible Nylo-Seal tubing instead of the standard aluminum. 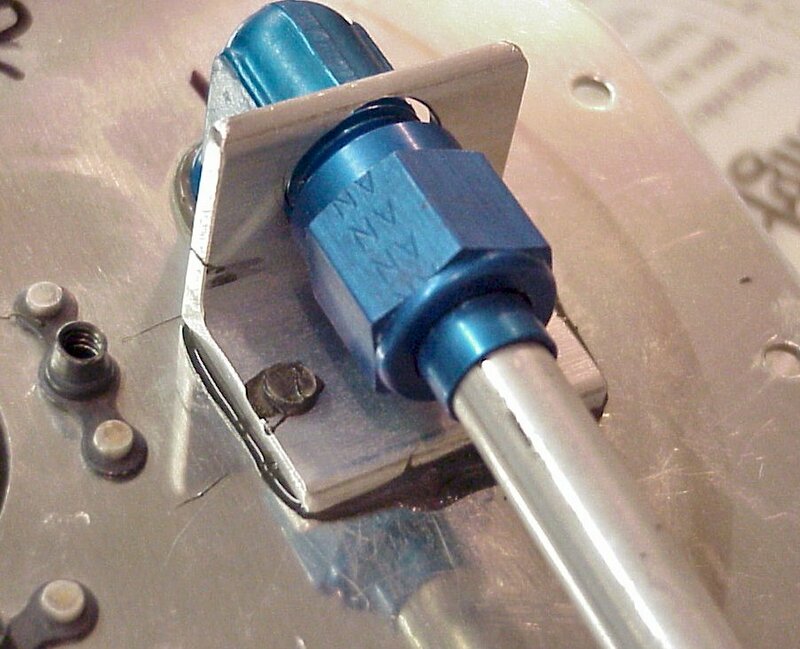 This pitot also includes static ports. Using this system would allow me to eliminate the dual static ports normally plumbed in the rear of the fuselage (simple is good! 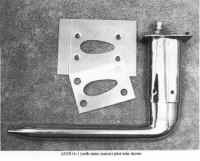 ), have all my pitot and static tubing in the same vicinity for leak troubleshooting, and have a more "aviation" looking pitot tube. I have since heard reports from builders with an identical installation who report fairly large indicated airspeed errors. Therefore I have also installed the standard static port system. Both static port lines will terminate under the left passenger footwell where either can then be hooked up to the tube that goes up to the panel. This will give me the ability to test the difference between the two and use whichever is more accurate. 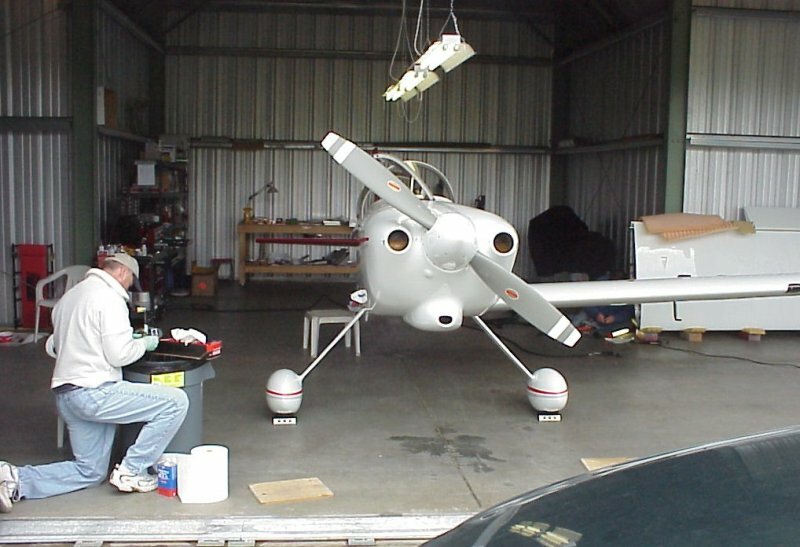 After final installation of the AN5814 pitot tube pictured above I realized "jeez, that thing sure is big". Frankly, it looked kind of funny. Also, my stall speeds were indicating a bit high and I had just flown in another RV-8 with the AN5812 tube in the same mount and his stall speeds were right in line with the book. So I ordered the shorter PH502-12CR which is quite a bit smaller, also heated, but does not have a static port in it which I had decided not to use anyway. Much better looking, and it yielded a 2 mph reduction in indicated stall speeds. While doing a preflight one day and looking over the belly, I noticed the dreaded blue stain emanating from the right wing root. Horror of horrors! This is the sight that I had never wanted to see. I had my fuel tanks built by Don London (Aviacomp) in large part due to my trepidation about building the tanks correctly and leak free. Upon removal of the wing root fairing I quickly traced the leak to the front tank mount angle. Fuel was leaking out from behind it somewhere. After a fair dose of panic, we determined that the proper way to fix it was to remove the wing, remove the access cover, drill out and remove the bracket, clean everything up, re-Proseal and re-rivet it, and re-install the wing. It actually wasn't as bad as it sounds, and that's exactly what we did.